Following the popular Jacob Yikes exhibition Bad Company, which closed out 2018, Fiksate kick off their 2019 schedule with Face Value. In the tradition of survey shows such as CAP’D, Fiksate shifts focus to a group exhibition, bringing together local, national and international artists for Face Value. The exhibition is a continuation of last year’s incarnation of the same name, hosted at Fiksate’s previous location in New Brighton. While that show was positioned as an exploration of portraiture through the lens of urban art, design and illustration, the 2019 show expands beyond portraiture, embracing character and figurative work to investigate these forms as a preoccupation of urban contemporary artists. The line-up is impressive, including international heavyweights Anthony Lister, Handbrake, Tom Gerrard and Mulga from Australia, KoeOne from the UK, and Voxx Romana from the US. 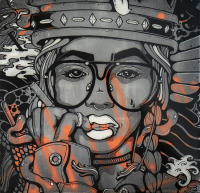 New Zealand is represented by leading urban contemporary artist Elliot O’Donnell (also known as AskewOne), and Auckland’s Erika Pierce and Component. While the local flavour is represented by established and emerging figures, including Jacob Yikes, Ikarus and Joel Hart, Dove, Tom Kerr and Meep. Identity has always been a key element in graffiti writing, the name a central component both formally and conceptually, and indeed, post-graffiti practices have always sought an instant connection with its audience. As a result, it is not surprising that faces and figures appear consistently throughout urban art. From characters accompanying graffiti pieces, to iconic faces rendered in an unmistakeable style, at times produced in the repetitive and performative manner of a tag, urban artists have been drawn to the power of these forms of imagery throughout the culture’s history. Within this broad narrative, the artists and works in Face Value represent an array of approaches to faces and figures, for many such an interest is long-established and enduring. Some, like O’Donnell and Meep, explore psychological, emotional or cultural profiles through portraiture, including self-reflection. Others re-frame popular culture references or create surrogates of themselves in characters. For some artists it is the creation of an iconic emblem or style for which faces or figures are the vessel for a style or method of creation, evident in the work of Lister or Kerr. Original generation time 1.3098 seconds. Cache Loaded in: 0.0154 seconds.